As a non-EU spouse of a UK citizen living in France, I will be applying for an EU Family Permit and residency card in the UK to not only be able to visit the UK, but perhaps if we decide to settle there at a later time. This permit may take the form of a sticker or “vignette” in my passport. Were my passport to expire soon, I would then have to reapply and get my sticker restored in my new passport. So, why not start with a new passport that will outlive my need my permits? …besides which, several countries require a passport be valid for at least 6 months from the date of entry in that country. Better safe than scrambling! Last post, I talked about some of the variables associated with living in France. This time, I will be ruminating on the pros and cons of relocation in the UK. If, as an American, I applied for a spousal visa in the UK, it would cost upwards of $850. There would be postage fees and costs associated with obtaining my biometrics in Charlotte, a city two hours away and the closest immigration service center to me. One of the good things here is that having applied for a Visitor to Marry visa not that long ago, I am quite familiar now with the UK visa process. The applications aren’t that different…just much longer in the case of a spousal visa. 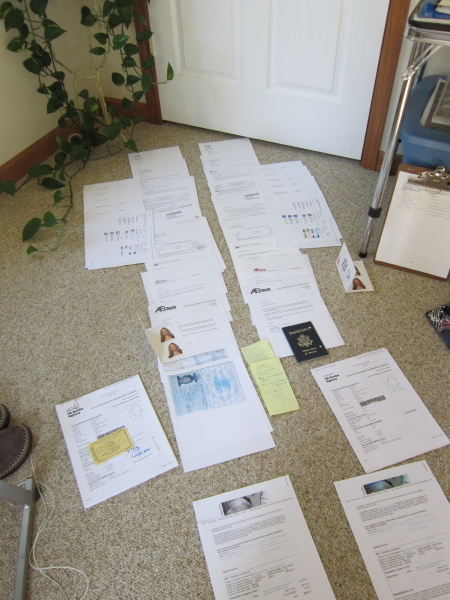 Since the visitor visa, once spread all over my floor, when compiled was about two inches thick, I’m thinking the spousal visa will end up being even thicker. Do you have any idea what goes into these applications? I certainly didn’t. In some ways, it feels like everything under the sun…bank records, tax documents, birth certificates, divorce decrees, proof of marriage, what I’ve eaten for the last 3 years, and oh, something really fun called a financial requirement form. It looks like a real nightmare to fill in, but I won’t go there right now. (I’m just kidding about the what I’ve eaten part). Now, one would think that since I had to have my biometrics taken for the visitor visa a few months ago that I would have already met that requirement. Not so! Apparently, I would have the joy of doing that all over again. No biggie; just a pain. Stuart is currently in France. We are lucky though because he is contracted by a UK company and is paid in the UK, so establishing proof of income won’t be an issue. The challenge is that Stuart will have to find a place for us to live. While finding something is not an issue, timing certainly is. This application process can, according to a friend who went through it several years ago, take as little as three weeks. It can also, according to a recent article, take up to 12 months. Why should Stuart uproot his life in France now when it could take a year before we got visa approval? Enter the cousins. We are blessed that Stuart has generous cousins, a married couple, who have offered to open their home to us so that we can take the time to find a place of our own. This makes everything so much easier. With an address, we can now apply for our visa without Stuart having to rush to relocate in the UK. Apparently though, getting a UK driver’s license…I mean licence (that’s another thing…all those misspelled words over there!) is no less joyful an affair than trying to get one in France. The success rates are about even…44% passing. However, the fact that the test would be in English and not a language I barely understand is a definite plus. In fact, being in a country where I understood the road signs, the mail, the food labels and everything else would certainly make life easier. Documents wouldn’t need to be translated either. The other benefit of living in the UK is that it would be so much easier for me to re-establish my client base, and I could be teaching workshops in no time. Plus, I could schedule book signings and increase my book sales there. Sounding pretty good, ain’t it? The main drawback of life in the UK is…well…life in the UK. It’s cold, it’s depressing, and it’s expensive. We’d relocate to the sunniest coast, but even in the height of summer, temps don’t generally break 70F. That’s practically still winter! During my visit for marriage, one of the first things that struck me was how miserable everyone seemed in the cities. Living in Asheville for 10 years, one of the happiest cities in the US, has spoiled me so! The area of Devon was nicer than the central areas, and I could see myself living in certain parts there even despite those narrow little roadways. In fact, my whole life, I have wanted to live by the sea. So maybe, just maybe, the UK would be OK if we lived by the shore. And the grocery stores there, after having been in France, Eee!!! Delight! But I also recall how upon disembarking from the ferry once back in France, the whole sky opened up and the sun shone down gloriously! I’m pretty sure I heard angels singing as I removed my “tea cozy” hat, scarf, and sweater (which I had to wear in September no less!). The whole world was smiling again. But it would also be much simpler for us to eliminate the third country from a complex-enough two-country life. And it certainly would be nice to ultimately share a country with my Honey and not just be a permanently floating expat. Who knows? Maybe establishing residency and then citizenship in the UK is the best way to do that.